This pattern is for all Standard Gauge Machines with a ribber. TENSION At tension 2 on both beds, with fine ndl bar inserted, working in full needle rib with slide lever to 1, the machine is set with the main carriage to knit and the ribber with the right PR lever to upper position and the small lever to the left of the main ribber dial to the upper P position. Check Top back for cast on details. On steaming the swatch lengthwise I achieved a tension of 21 sts and 68.5 rows to a 4 inch square swatch, knitting with 3 strands of Crepe with 2 strands in one tension mast and the 1 in the other. Take 3 prong transfer tool and move both end 3 stitches in one needle (towards centre of bed) on both beds. Return empty ndls on both beds to rest position. On Main bed and ribber there will be 1 needle with 2 stitches on. Bring 42/42 (45/45, 47/47, 50/50, 52/52, 55/55, 58/58, 61/61, 64/64)sts to WP on both beds ready for full needle rib. Racking lever set on 5 and Half Pitch Lever to H so ndls do not collide. Main Carr to knit and Tension 1 on both beds. Slide lever to 1 Knit 1 row. Insert cast on comb . Push in right hand part (slip) button on MC and left Cam lever to PR on ribber. Same tension knit 3 circular rows. Hang on weights. 3.Cast off 3 (4, 5, 6, 6, 8, 9, 10, 11)sts both sides on both beds knitting 2 rows and return these ndls to NWP. 5.Continue straight to RC 393. Incr tension to 10/8 and cancel all ribber settings. Knit 1 row, holding work down well. Then with a fine waste yarn knit 10 rows MT. Run work off machine and latch loops through each other. You must have a loose cast off edge because this is a Tucked fabric and stretches widthwise tremendously. Remove waste yarn. 1.Work as for back until pt 4 is completed. 3.CL. Bring to hold ndls on main bed from 7 right to end st on the right, Take a nylon cord and knit back these main bed ndls in hold to NWP. Now knit the corresponding ndls on the ribber to NWP . You do not want to knit these ndls for the first side of the neck. Hook a long claw weight onto these centre sts and move up work as you knit to ensure they always knit off. 7.Cast off very loosely as for back. Remove the cast on comb if not already removed and re weight the remaining side. 8.With the left side of work complete, return all of those ndls to NWP. Take empty carriage to the right, and thread with MY. Carefully pull the cord to release the sts knitted back with nylon cord. Return these ndls to WP. With CL. RC back to 346. reset ribber carriage, ensure your settings are correct and you are in the correct pattern sequence, 1 tuck row, one knit row. 11.Cast off very loosely as for back. 2.CL. Bring ndls from 3 right to end WP ndl to hold on main bed. Take a nylon cord and knit back these main bed ndls in hold to NWP. Now knit the corresponding ndls on the ribber to NWP . You do not want to knit these ndls for the first side of the neck. Hook a long claw weight onto these centre sts and move up work as you knit to ensure they always knit off. 3.Knit 1 row on ndls remaining in work. Now cast off centre 2/2 sts on both beds, cast these off very very loosely. I transferred them to the mainbed then wrapped the yarn round the ndl twice behind the latch and once in the latch. 10.Cast off very loosely as for back. Remove the cast on comb if not already removed and re weight the remaining side. 11.With the left side of work complete, return all of those ndls to NWP. Take empty carriage to the right, and thread with MY. Carefully pull the cord to release the sts knitted back with nylon cord. Return these ndls to WP. With CL. RC back to 220. reset ribber carriage, ensure your settings are correct and you are in the correct pattern sequence, 1 tuck row, one knit row. JOIN shoulder seams tapering the seam from zero at the neck edge to about 1 inch at the shoulder seam. 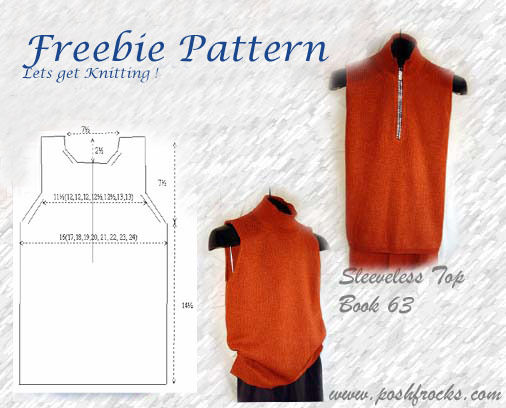 Join both shoulders on the zipper top, and just one on the round neck top. At MT plus one dot knit 5 rows, then at MT + 2 dots knit a further 5 rows. Push the right hand part button on the main carriage and the left hand button up on the ribber, knit 2 circular rows. Incr to MT+2 and knit a further 16 rows (8 circular rows). Run the mainbed sts onto nylon cord , then waste knit and run off machine. If you use the ribber carriage and keep bringing these ndls to hold they will knit..
Now transfer the ribber sts to the main bed. Knit 1 row at MT+3 and take off machine on garter bar or waste. Bring 50/50 (52/52, 54/54, 56/56, 59/59, 64/64, 68/68, 72/72, 72/72) Sts to WP. Hang armhole equally over sts evenly along a line of sts with wrong side facing you. With 3 crepe at MT+3 and regular feeder, Knit 10 rows. Pick back up the line you originally picked up, knit 1 row, cast off loosely with MY. Repeat for other half. Press this trim hard and flat. Work as for armhole trim but over less sts, for the 25 cm zip I used 30/30 sts. Make a note of your collar sts , so they match and always follow a rib line. Steam press all pieces except the neckline, to avoid making the rib 'soggy', On the zipper front tack in zip before machining - they slip so easily. You should have a ½inch gap at the front for the zipper teeth to show. I successfully joined on the knitting machine, using 2 strands of Crepe or join with zig zag st on a sewing machine) then insert elastic. Close elastic channels and sew in all ends. Final press flat on the board, not over it to avoid stretching.